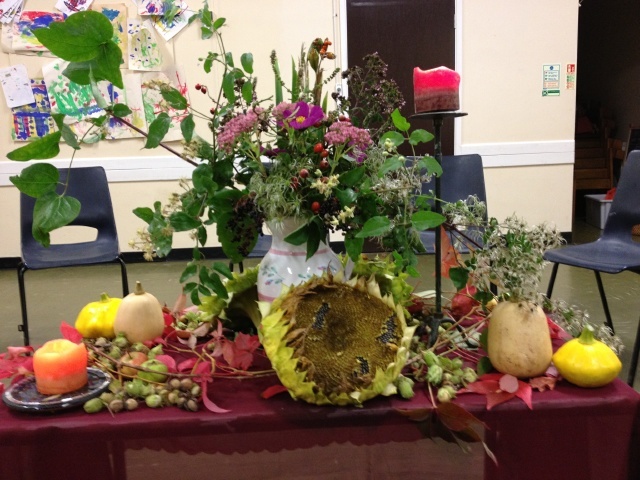 Thirteen people gathered around a beautiful creation celebrating the abundance of this year’s autumnal harvest – hazels, fruit, squash, berries, flowers and reddening leaves – at the Inner Transition open meeting in September. Our theme was reflecting on “what we are harvesting” – looking back over the previous year or longer and seeing what seeds we had sown that were bearing fruit. The group gathered included a mix of locals as well as travellers from Transition projects in Wales and the south east, and three students from the newly started year long courses at Schumacher. We enjoyed the contrast to one of the meetings earlier this year, where we were remembering the seemingly endless cold of the winter and spring – leading to such a warm and revitalising summer for many of us (not in Wales!). How it feels to go into a time of cold and darkness feeling nourished by the sun, instead of starting with a feeling of lack. The next Inner Transition open meeting is planned for December 2013, with a piece from the Inner Transition Reading group sharing something about their insights and reflections - all are welcome. More details will be posted to the Events calendar nearer the time.